Given all the creams and topical potions that abound to keep your skin at its best, many often overlook the power of nutrition in giving your skin true, lasting vitality. Nourishing our skin from the inside is just as important as protecting it on the outside. Maybe it’s time to rethink that skin care routine and focus on food, not formulas. What you eat every day can make a big impact on how both you and your skin function. What foods are best for that? Have a read through for some easy summer diet do’s and don’ts to keep you glowing all year long. 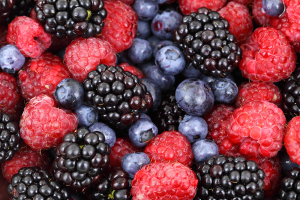 Berries are chocked full of antioxidant compounds. Antioxidants help us fight off free radical damage which is, unfortunately, an unavoidable consequence of the world we live in. Our food, our household products, other environmental chemicals and even stress can create free radicals which damage our cells. Antioxidants help knock these out and restore proper balance and function. Broccoli, cauliflower, Brussel sprouts, cabbage, bok choy….they are all fantastic when it comes to your skin. They are high in vitamins A and C, which are important for our skin, and the phytochemicals in cruciferous can help reduce inflammation and promote estrogen balance, both which can be a huge boost to your epidermis. Healthy fats are key to healthy cells, and healthy cells equal healthy skin. Wild salmon is a great source of Omega 3 fatty acids, known for their powerful role in reducing inflammation. There are more Omega 3 sources besides salmon, however. Other animal sources include mackerel, sardines, tuna, and anchovies. Plant-based sources include chia seeds, hemp hearts, flax seed, and walnuts. This tasty fruit is rich in monounsaturated fatty acids and antioxidants which helps keep skin supple and ward off the effects of aging. More reason for some guacamole when the weather heats up! Yet another fantastic fat source that is helpful for our cells and also contains a host of skin-protecting antioxidants. Additionally, they are high in fiber, which may not seem directly related to your skin, but anything that supports digestion and promotes regular elimination will help detox your skin and body as well. We are still on a fat kick here. As you can tell, getting good sources of healthy fats in your diet is key. A fat-free diet is not the way to healthy skin. Coconut oil is another of those powerhouse fats. It has potent anti-microbial properties to ward off bacteria throughout our body and can support our immune system. All of this, in turn, promotes healthier skin. Easy ways to use coconut oil would be with sautéing, using as a fat in baking, or mixed into smoothies. Personally, I like to use full-fat coconut milk in making chia seed pudding to get in a healthy dose. Fluids are super important for keeping out cells well hydrated, so bone broth can certainly help with that, but it’s also a major source of collagen. Collagen, which tends to decrease with age, is what keeps our skin firm and elastic. A little bone broth can go a long way in increasing hydration and giving our skin the building blocks to repair and restore the collagen in our skin. Use as a warm evening beverage or mix into soups or other dishes that call for broth. We know that fermented foods, or foods rich in natural probiotics, are good for our gut. A healthy intestinal tract equals good digestion and good digestion shows on our skin. When we are absorbing our nutrients properly and eliminating toxins on a regular basis, it will produce noticeable results on the outside as well as the inside. Eat fermented foods daily to balance your gut bacteria and keep that digestive process running smoothly. Examples of fermented foods include sauerkraut, kimchi, beet kvass, water kefir, kombucha, tempeh, pickled veggies, and miso. While some dairy products are fermented as well, best to keep those to a minimum as dairy is often implicated in inflammation and skin issues. I know many have a love/hate relationship with this herb, but if you are a cilantro lover out there, more reason to use it early and often! Cilantro contains chlorophyll, which has powerful detoxifying properties in the body. Cilantro also supports liver detoxification, which may help reduce or prevent acne by helping rid your liver of toxins more quickly and efficiently. Sprinkle cilantro on anything and everything. Even add to smoothies or pressed homemade juices. I can’t say enough good things about leafy green vegetables. Kale, spinach, chard, romaine….they are all great sources of iron, calcium, B vitamins and fiber. More importantly for your skin, they are a good boost to your liver for detoxifying the body. As we’ve said before, detoxing from the inside will show outside in your skin, so eat up a variety of greens daily to get that summer glow.